Barcelona, September 25th, 2017 – iVascular S.L.U. has announced the initiation of the T.I.N.T.I.N. 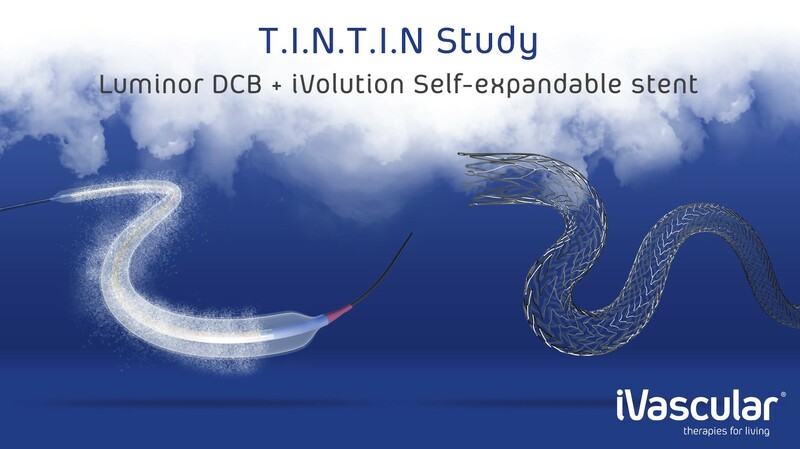 trial, evaluating the combined therapy of Luminor drug coated balloon (DCB) and iVolution self-expandable stent. T.I.N.T.I.N. study is prospective, investigator-initiated, non-randomized, multi-center trial, investigating the 12 months safety and efficacy of combined Luminor DCB and iVolution self-expandable stent in TASC C and D femoropopliteal atherosclerotic lesions. “Both Luminor and iVolution have already demonstrated their safety and efficacy in previous studies” stated Lluis Duocastella, CEO of iVascular S.L.U. “T.I.N.T.I.N. trial is the following step to prove their combined benefit for the patient with the most complex lesions”. Dr. Koen Deloose (AZ Sint Blasius Dendermonde, Belgium), is the T.I.N.T.I.N. trial principal investigator. He has enrolled the 1st two patients on September 22nd. “We are excited to drive the first multicenter study evaluating the dual therapy DCB + BMS in real life TASC C and D lesions. Performing this with a drug eluting balloon that has shown the best results in a RCT as of today, and a self-expandable stent that has proven its efficacy in EVOLUTION trial, we expect outstanding results in the most challenging SFA lesions” declared Dr. Deloose.